Professor Halfbrain has spent his entire weekend by cutting lots of wooden $50\times50$ checkerboards into lots of polyominoes. He looked at various pattern polyominoes with area $49$, and always tried to cut as many copies of the pattern as possible out of some wooden $50\times50$ checkerboard. 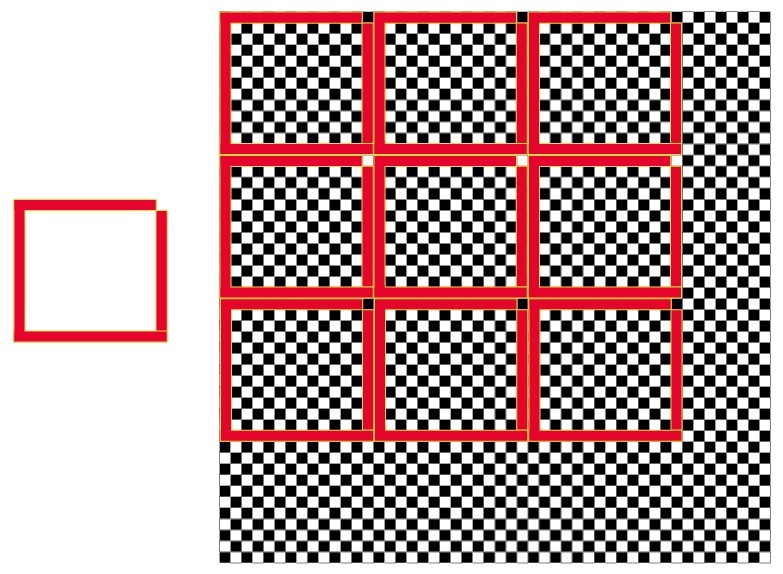 The pattern polyomino could be rotated and flipped over, but it always had to be aligned with the cells of the checkerboard. For most patterns, the professor was able to cut quite a number of copies while wasting only a small fraction of the checkerboard area. Professor Halfbrain has also proved two extremely deep theorems on such checkerboard cuttings. Professor Halfbrain's first theorem: For every possible polyomino pattern of area $49$, it is possible to cut at least one copy of the pattern out of a wooden $50\times50$ checkerboard. Professor Halfbrain's second theorem: There exist polyomino patterns of area $49$, for which it is not possible to cut 52 copies of the pattern out of a wooden $50\times50$ checkerboard. This puzzle asks you to improve the two theorems of professor Halfbrain and to make them even deeper. Find an integer $x$, so that "one copy" in the first theorem may be replaced by "$x$ copies", and so that "52 copies" in the second theorem may be replaced by "$x+1$ copies" (again yielding true statements, of course). If the minimal bounding box of a 49-cell polynomino is $x\times y$, then $x+y\leq 50$. Proof: by induction. A 1-cell polyomino fits in a $1\times 1$ box, so its semiperimeter (i.e., $x+y$) is 2. Every $(n+1)$-cell polyomino is formed by adding a cell to an $n$-cell polyomino, and that additional cell can increase the $x$ size of the bounding box or increase the $y$ size of the bounding box, but not both, so if every $n$-cell polyomino fits in a box of semiperimeter $n+1$, then every $(n+1)$-cell polyomino fits in a box of semiperimeter $(n+1)+1$. Four $x\times y$ rectangles with $x+y\leq50$ always fit into a $50\times50$ square. Proof: by construction. Use a 'pinwheel' arrangement where the two $x\times y$ boxes in the NE and SW corners are placed with $x$ horizontal and $y$ vertical, and the two in the other corners are placed with $y$ horizontal and $x$ vertical. Five copies of a 'Plus' polyomino (with two length-$25$ arms intersecting in the middle) can't be placed in a $50\times50$ square. Proof: First, a few subfacts. For convenience, I'm going to define the $50\times 50$ square as running from $\langle-25,-25\rangle$ to $\langle25,25\rangle$. a) The center of any Plus must be inside the inner square from $\langle-13,-13\rangle$ to $\langle13,13\rangle$ (or else it'll go outside the bounds of the $50\times50$ board). b) The center of one Plus can't be placed anywhere in the bounding box of another (or else the two will overlap on their arms). c) If the center of a Plus is placed anywhere in a $13\times 13$ box, its bounding box covers that entire space. Now consider the four quadrants from $\langle0,0\rangle$ out to $\langle\pm13,\pm13\rangle$. By b) and c), each of these quadrants can only have one Plus's center placed within it, but between them these quadrants cover the entire 'legal' space (per a) ) for placing Plus polyominoes. Since we can fit only one per quadrant, we can fit at most four. You can make a polyomino consisting of a 13x14 square with an 11x12 hole in the middle with one missing corner tile. This can only fit 9 times into the 50x50 board. I believe this is the worst possible fit, so I would substitute 'nine' and 'ten' for 'one' and '52' in the first and second theorems respectively. Not the answer you're looking for? Browse other questions tagged mathematics geometry checkerboard dissection polyomino or ask your own question.